The Internet in Africa has been underdeveloped. But now the situation is different. In Nigeria, of the 194 million inhabitants, Internet users totaled 48,366,000 179 people in 2015. Novice traffic terminators keep visiting the VoIP forum in order to explore opportunities to make money in the country. Not long ago, the United Nations implemented the Internet connection program on the African continent in more than 12 countries, including Nigeria, who took ninth place in Africa in the number of Internet users. 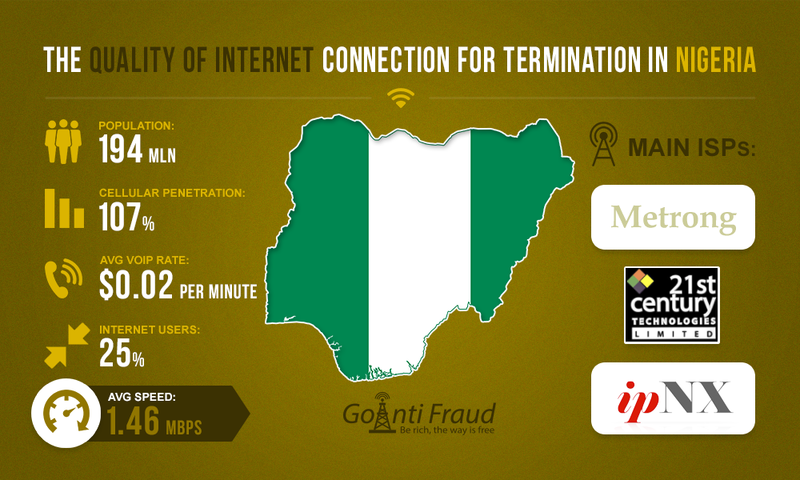 However, in Nigeria the Internet is not good enough to terminate the voice traffic. Beginners who want to install GOIP 16 gateways will have to work hard to ensure a stable and high-speed Internet connection as the normal operation of gateways requires wired Internet Dial-Up, DSL, and ADSL, which are poor in Nigeria. For this reason, an increasing number of fans of the World Wide Web prefers wireless technologies. The government of the country supports the trend because it is easier to introduce a new way of communication here. Even in 2002, when the number of wired connections was bigger, only 1 user of the 100 respondents had a dedicated Internet line. Popular providers offering wireless internet in Nigeria are, 21 ST Century, and IPNX Nigeria. Metrong has the greatest number of customers in the country - almost 50%, while the rest has the remaining number of users. Another specificity of the Internet market in Nigeria is that its providers calculate the value of each connection individually. Ready-made packages for clients cannot be found in the public domain. The average speed of Internet connections is typically 1.46 Mb/s, which is enough to terminate traffic and install equipment, such as GoIP 16 as 44 Kb/s is sufficient for a single port. Terminators wishing to intall VoIP-devices in Nigeria should take into account that the best coverage of the wired internet is available in big cities such as Lagos, Kano, Jos, Abuja, Oshogbo, and Ibadan.